People tend to read a web page differently than they do on paper. This means that the best approach when writing for the web is different from writing for print. A website works best if people can find what they need quickly, complete their task and leave without having to think about it too much. The guidance on writing for Imperial’s website is based on research into how people read online and how people use the website. You can access this guidance as an online web skills module or through one of the monthly training sessions run by the College. 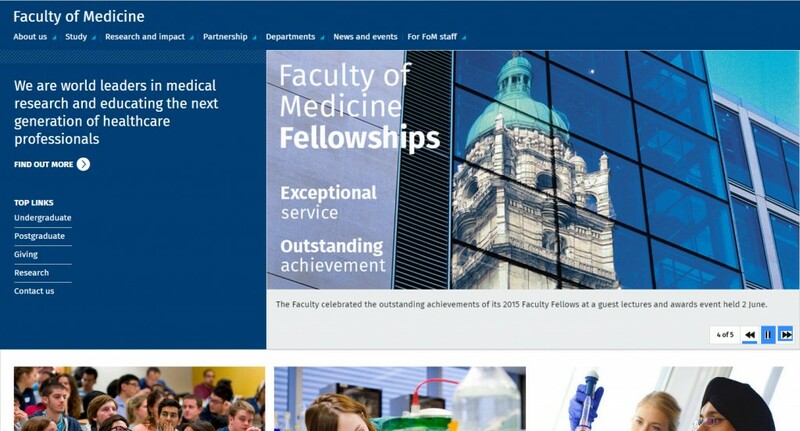 Central ‘Faculty of Medicine’ webpages – looking a little bit different! As you may well have noticed by now, the central ‘Faculty of Medicine’ website has moved into Imperial College’s new website content management system (CMS). These pages (the majority of pages under www.imperial.ac.uk/medicine) have been migrated and refreshed to match the College’s new look and to deliver a better user experience for visitors to the site – no matter what device they may be using: mobile, tablet or desktop computer. To prepare for this transfer a team of editors in the Faculty have worked hard to review and recreate their existing pages into the new format, and we’d like to thank them for all their hard work. This is the first phase of a programme of transfer for the many sites which are related to the Faculty of Medicine. Sites will need to be moved from our current Faculty system (an older, CMS which is unique to our Faculty) into the College’s new, mobile-friendly system. For more detail about future transfers, please see the ‘what’s next?’ section below. What to expect from the new pages. Now the new pages have gone live you’ll notice that existing urls and links to central Faculty information held on these pages have changed. We’ve worked to keep a number of our most important url links going to their direct equivalent – but with such a large website move, it’s inevitable that some existing links to pages may no longer work as you expected. If the old link you are used to using has changed, you’ll either be redirected to the appropriate general area of the new site, or be taken to a ‘404’ page which will attempt to locate a relevant page in the new site. Alternatively you can use the College search box which appears at the top of every web page. We are very interested to hear your experiences of using the new site as you get to know it during the first few months after launch. In particular we’d very much value your opinion of the new ‘For FoM staff’ section (we aim to continually improve this as a resource to complement the College level pages – and need your input to do that!). The next stage of the project will be to rollout a programme of activity to work with site owners to help them migrate content from their departmental, unit or research group pages into the new system and designs. This activity will take a year to complete, and will be undertaken as a phased roll-out which will be planned with each of the Departments. If you are a Faculty CMS site owner we will therefore be contacting you over the coming months to discuss your training needs and help you plan the transfer of your pages into the new system. After a few exceptionally busy months, we relaunched our Faculty webpages on Friday 17 January 2014. The new website has been in development for a while to showcase the work of the Faculty within our main research themes. In order to do this, research landing pages have been developed and the old and out of date material removed. A large and exciting part of the project was to produce a high quality video for each ‘research landing page’ to more easily communicate what the Faculty is doing in each main area of research. Whilst the filming was completed in late-October (thank you to all that were involved! ), the editing process took a bit longer than had been anticipated – trying to cut down the footage filmed in half in order to fit into the time allocated for each video was tricky. We produced 13 videos in total: 11 for the research themes, another to give an overview of our research and one to better communicate how, through the AHSC and NIHR Imperial BRC, the Faculty translates its research. With the new College website design and content management system (CMS) on the horizon, we have taken the opportunity to review content, and where necessary, cull out of date, old and redundant pages. This will make transferring to the new design and CMS a much easier, and less time consuming, process. By using Google Analytics data (and information on when pages were last edited), we reviewed page views etc to decide what content was clearly not being visited and where content was extremely old, removing it from the website. There is still work to be done to further improve the website and we are looking forward to getting to grips with a new content management system and college website design in the coming months. We’ll be in touch with website editors and owners in the coming months to discuss and plan how the wider faculty website transfer process is to happen. If you have any comments or questions, please use the comments section below. We received over 700 responses to the Faculty Communications survey – thank you to all of those that responded! Your contribution is very much appreciated. Richard Colquhoun (Neonatal Data Analysis Unit Manager, Department of Medicine) and Jocelyn Elmes (Research Assistant, School of Public Health) were each a recipient of a £50 amazon voucher. The data from the survey is being analysed – we will be working to identify some key activities to improve communication across the Faculty and in particular improve communication across the campuses which appeared to be a concern for a lot of those that responded. It also appears that information flows across all areas in the Faculty aren’t ideal at present so again, we will be looking at what could be done to improve this. If you have any comments, ideas or suggestions, please post a comment below, contact James Moore or Neil Young. We’d be really interested in hearing anything you have to share. We’ll be providing a summary of the results in the coming weeks. Useful for instant messaging but also for instantly seeing a colleague’s availability, initiate a video chat (hardware dependent) and for instant collaboration. RSS – what is it? The Twitter avatar competition, launched back in December 2011, has now closed. The Faculty would like to thank all those who entered. The entries were judged by Professor Sir Anthony Newman Taylor, Principal of the Faculty of Medicine, and Professor Jenny Higham, Deputy Principal of the Faculty of Medicine. We are pleased to announce the winning entry (opposite) is from Dave Taylor and Robin Winter, from Medical Media and Design Laboratory (MMDL) in the Department of Surgery and Cancer, who will share the prize. 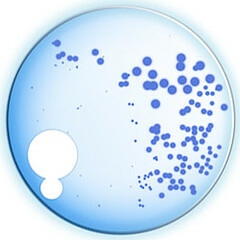 The avatar is a stylised version of the iconic image of Sir Alexander Fleming’s plate culture of the fungus Penicillium notatum; the design honours this discovery which was made whilst working at St. Mary’s (now one of the constituent medical campuses of the Faculty of Medicine). The avatar can now be seen adorning our Twitter and Flickr pages. A review is underway of Professional Web Pages (PWPs), which are used on the College website to offer contact details and information about the activities of staff such as publications and awards. To guide a redesign of PWPs, staff are invited to participate in a survey to help identify the content and features which are particularly important for current and future users of these online profiles. The survey should take about five minutes to complete, and all those who complete the survey will be entered into a draw to win a £100 Amazon voucher.